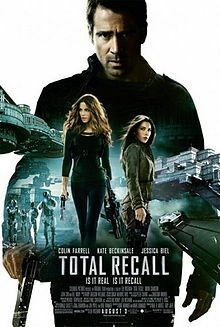 Today, I watched Total Recall starring Colin Farrell and directed by Len Wiseman. Before I dive into this review, a brief warning. Here there be spoilers! Since this is a remake of a classic sci-fi actioner from the 90's, I won't have much choice but to drop some rather major spoilers when comparing this film to the original. So, if you don't want to know plot details for this movie, just shuffle right on past this review! The story of Total Recall centers on Douglas Quaid, a factory worker living a boring life in a crappy little apartment with a ridiculously attractive wife, played by Kate Beckinsale. He's passed over for promotions at work and spends his evenings slurping beers with his buddies at the local dive bar. He keeps having the same dream, though, where he's on the run from some bad guys with a love interest that most definitely is not his wife. These dreams, coupled with his humdrum lifestyle, lead Doug to Rekall, a company that can implant memories directly into your brain through chemical injections. Said memories are customizable, offering a wide variety of situations and scenarios for you to remember. Doug decides he wants to remember being a spy. This is where the movie takes off, with Doug being chased by various bad guys, both real and robotic, lead by none other than his wife, who's really a spy herself, attached to Doug to keep an eye on him. The girl of his dreams (Jessica Biel) shows up just to bring everything full circle. So far as comparisons to the first film, this all follows the same basic plotline. Some of the specifics are different, but the core of the story remains the same. Douglas Quaid isn't really Douglas Quaid. He's Houser, a former double agent who's had his memory and personality erased and implanted with a new one. Where this film greatly differs from the first is all the action takes place on Earth, whereas the first film spent a great deal of time on Mars. Another key difference is the elimination of the Richter character, played by Michael Ironside in the first film. His character seems to get merged with Doug's wife Lori, who not only chases him relentlessly throughout this film, but even disobeys orders to take him alive by giving the order to shoot to kill to the men under her command, just like the Richter character did from the first film. Why, oh why, did this movie get made? Don't get me wrong, it's not a terrible movie. With some tweaking of the plot and characters, this could easily have been a standalone sci-fi actioner. Not a great one, mind you, but not a terrible one either. Instead, the bankrupt braintrust that is Hollywood decides to remake a movie that just didn't need to be remade. The original Total Recall (1990) is one of Arnie's classic action films. At the time of it's production, it was the most expensive movie ever made. It was simply awash in cutting edge special effects, action set pieces with plenty of guts and gore, and Arnie's usual ham-handed reading of his lines along with his dreadful one-liners. In short, it was a pretty great action movie. So why remake it? More importantly, why remake it if you're not going to improve upon it? Colin Farrell is absolutely dreadful as Douglas Quaid. He spends the vast majority of the film in a state of perpetual confusion, which he plays off by making facial expressions that had me believing he needs more fibre in his diet. Kate Beckinsale isn't bad in the now-I'm-your-wife-now-I'm-trying-to-kill-you roll, but it's nothing inspiring either. Bryan Cranston, as the villainous Cohaagen, is hardly used and seems badly out of place. Jessica Biel as the original love interest Melina is also misused and seems to be there really to give Doug someone to worry about and rescue while he's avoiding his wife and her goons. The special effects aren't bad, especially the robotic police force known as the Synthetics. The look and feel of the film, in particular the cinematography, is actually quite good. The film takes place on opposite sides of the world, so you have one very clean looking, Minority Report style metropolis and a much dirtier, Blade Runner-esq style slum. Both are rendered quite well, giving you no confusion as to where the action is taking place between the two locales. If I had to make a gripe about how the film was shot, it would be the nearly Star Trek (2009) level of lens flare that shows up in nearly every shot. It's distracting and really adds nothing to the film. In short, you have a mediocre movie that's a remake of a great movie. This was a bad idea from it's inception. It never should have been green lit, let alone actually written, shot and released to a public that, when looking at the box office numbers, gave it a collective "meh". "Why, oh why, did this movie get made?" Were you able to spot the scene/scenes that were filmed in St Thomas at the FORMET plant ?? I hope Jessica is a little more selective next time! Wiserman probably thought, that through association of a popular 90s movie, people will go see this movie even if its bad. Cha Ching!